Our 6th annual visit to the Enchanted Forest has come around once again. The boys have been counting down the days to last weekend since we got the tickets in March! We booked an earlier twilight showing this year (as mucking about with Loki’s bedtime results in him turning into a feral little goblin – Eeks!). This year’s theme was “of the wild” and after seeing some sneaky peeks on their Instagram account we were very excited. 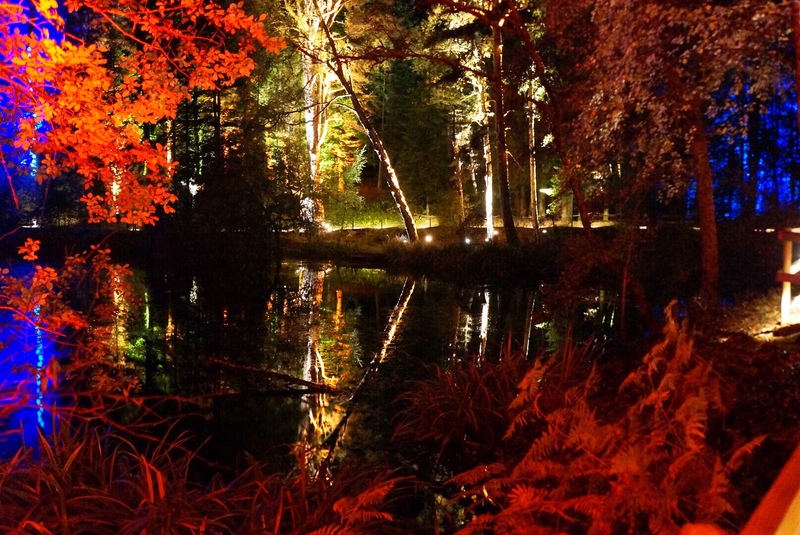 The Enchanted Forest is the current Winner of the UK’s best Cultural Event. It is the wonderful Sound and Light show set in the beautiful location of the Forestry Commission Faskally Wood in Pitlochry, Highland Perthshire. A short queue in Pitlochry got us in the mood. A leaf stamp and ticket check meant we were ready to go and as usual the bus trip down to the woods where the boy’s immediately claimed was the “the best thing ever” set the bar high. They appear to accidentally live a sheltered life that doesn’t involve public transport can you tell?! It was still quite light when we wandered down into the forest. Managed to get short changed and slightly conned into make a charitable donation buying glow sticks, which was frustrating, even more so when they didn’t work, but the darkening skies kept our moods high. The route had changed this year; backwards from previous years, which was oddly quite exciting! We wandered along to the bridge captivated with the music and lights, whilst guessing what they’d look like when it got properly dark. The bridge this year was deliberately boring according to the Steward stationed there directing everyone. Whilst it seemed a shame initially, because the bridge has always been an epic feature of the night, we actually think it’s a good change because it was always an epic bottleneck as you have to cross it twice to do the circuit. I’m sure all those romantics will find a new place to hold everybody up soon enough! After the bridge crossing we walked round and down into a woodland floor covered in flickering candle lights. This was Edward’s favourite part of the forest and from across the other side of the Loch it was pretty stunning glimmering away. The next part was the visual wonder of the light show, timed to beautiful music and projected onto a fan shaped water fountain it was truly a sight to behold. The boys were mesmerised. When the smoke poured out from under the platform they all gasped; it was so magical. We saw so many different woodland creatures and trees surrounded by nature’s treasures. Even spied a rainbow to Loki’s delight! By the time the 7 minute show had finished we realised it was almost dark, perfect time for a wee sit down to roast a marshmallow. So we quickly wandered down to the next part and stopped off at the catering truck. After getting short changed earlier on and a massive price increase from last year it turned out I couldn’t actually afford marshmallows so we had a drink and a wee seat and waited for the darkness to fully encompass the forest. The forest burst into life in a new way once it was dark. The paths took on a magical glow and the reflections in the water (even with the rain) made for the most beautiful scenes. We crossed the bridge again and found ourselves at the Illumaphonium which was hands down mine and Oren’s favourite part of the night. Interactive, musical and enormous! A Steward armed my toddler with a small baton and we spent the next few minutes taking turns whacking and banging the bars making the most bizarre and beautiful sounds. It was so much fun, the interactive element was brilliant! We had to literally drag the older two away from this section, there was much huffing! We disarmed the toddler and off we walked to the next bit. It was almost pitch black in the next section until a helpful Steward suggested we turned the flash on on our camera and keep our eyes peeled for some woodland friends. In the next section we saw giant balls of light all the way up the tallest trees in the forest. Oren said they looked like tentacles as they lit up and changed colours whilst dancing to music. The final section didn’t disappoint. For the previous 5 years this had always been the opening section so it was strange to be watching it last. It was a fast, up beat, dance with light in a small, but dense section of the woods. All the boys had a bit of a boogy and it geared us up to go around the whole forest again! If you ever find yourself in Pitlochry in October the Enchanted Forest is definitely worth a trip. The town is lovely and friendly and the Enchanted Forest is by far the best thing we’ve ever done with the boys. The ticket prices are really reasonable but after this year, with the catering changes, we’ll be bringing our own marshmallows and hot drinks – if we decide to go next time! You can find their website >here< and I think there are even still some tickets left for this year’s show! Just to add; I haven’t been asked to post this review, I only want to share our experience. Everything above is my own and honest opinion! Furthermore the Enchanted Forest Team have been in touch to thank me for my feedback and apologised for the short change incident and explained that they’ve changed Caterers this year.